I had to share this photo of a water station I saw when I stopped for fuel. 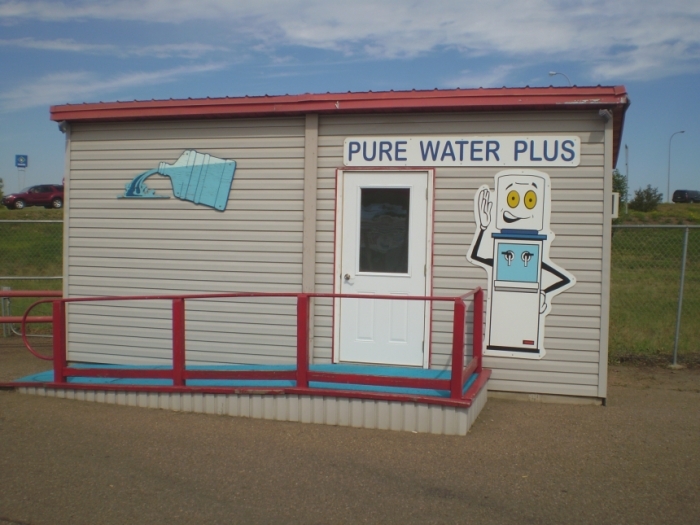 It raises two questions in my mind: Just how pure is that water? And what is the "plus"? (note the location of the water taps). Alrighty then, back on the road I go. Once I've spoken with a salesman of water filtering devices. You couldn't imagine how he portrayed the water we drink. If I was sensible with that kind of talking, I think I'd had stop drinking water at that moment. For now, I still having my hair, teeth and toes. Beautiful view. A dream for a geologist. It's a great place Lou. I've been there as well. I liken it to a mini Grand Canyon. It's hot as hell in certain spots though. It funny the story of it's name... Bad Lands, meaning just that, it's Bad to farm on. Pretty creative on the part of the Indian tribe that named it. Enjoy! Also in the area, is a museum where they are unearthing a ton of Mammoth fossils and all sorts of other stuff. They belive it was some sort of mud pit, or shallow lake full of silt. Google it with fossil museum in North Dakota. If you're anywhere near it, check it out. I wish I could remember the name of the place and wherre it was. I just remember it was really cool. Thanks loads for the pics. I have never been to that part of the U.S. Thanks for the pics. Not too many forests there, it seems. I like forests. North Dakota - wasn't that the land, were the Sioux and/or the Cheyenne used to hunt the buffalos? My wife and I share many fond memories of the ND Badlands. She fell in love with Medora. We would stop there every time we drove to the west coast. We did travel through SD once and the scenery was not quite the same. We did stop at Wall Drugs though. Hope to do trip again after my wife retires in a couple of weeks. There's always something new to see every time we go that way. Good morning again all, glad to know you enjoyed the photos. Von Paulus, a geologist's dream to be sure. You can see about 65 million years of Earth's history in just one look. Now as to what's in our water, I don't even want to know. But do keep in mind, alcohol is an excellent disinfectant. OvS, I love to go rock hunting when I am out in the Badlands. The fossil locale you might be thinking of are the Marmarth and Mud Buttes digs way down in the southwest corner of the state. 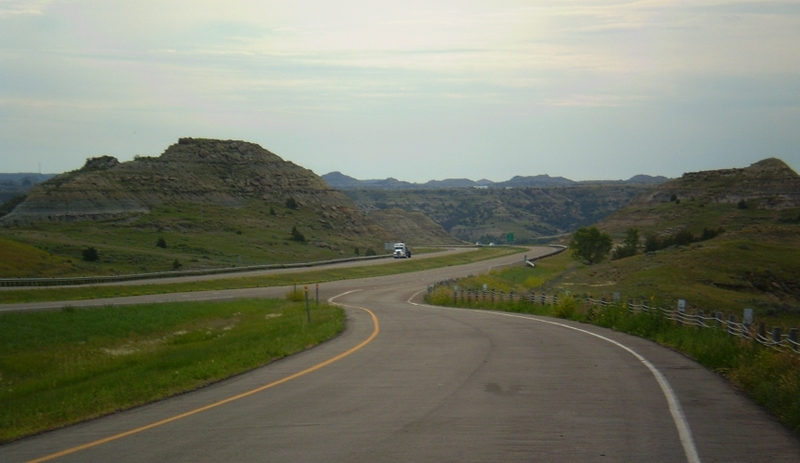 They are part of the Hell Creek Formation, which covers parts of Montana, and North and South Dakota, and if you like fossils it is a great area to go to. I have been there twice to do a bit of digging, and also been to the far other corner of the state as well, up in the Pempina Gorge excavations. carrick58, if you've never been, you should make the trip. I could even meet you for a cuppa' somewhere along the way. Hasse WInd, if you like forests you just come to Minnesota. I'll take you into some pine forests that are so tall and thick you'll be lost inside of five minutes. 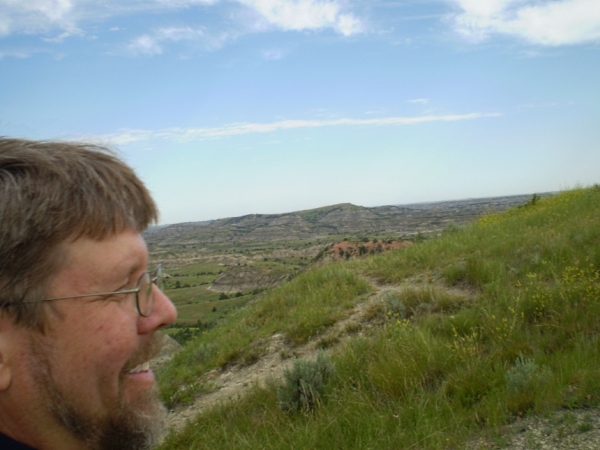 Ras, Medora is a great little town, (I was there on Wednesday), and the play is a lot of fun. As to those buffalo, if you don't make any sudden moves they tend to not even give you a second look. Years ago when my youngest daughter and I were camping in the north park of the Theodore Roosevelt we woke up one morning to find a full-grown bull buffalo calmly grazing about 20 feet from our tent. We very slowly came out of the tent and watched him, and he munched away on the grass for another minute or two and then moved along. You find out just how gigantic those animals are when you are that close to one. When I'm tramping around the Badlands I am far more concerned about surprising a rattlesnake than I am a buffalo, (not that I want to surprise either one mind you). Widowmaker, if you and the Mrs. ever get around to my "neck of the woods" be sure to let me know and we'll meet up. Olham, the Sioux and Cheyenne are likely the more well-known of the Indian tribes that lived and hunted in North Dakota. Other prominent tribes are or were the Dakota, Chippewa, Assiniboin, Hidatsa, Arikara, and Mandan. There were many others as well. Tony, you are quite correct about the scenery in the South Dakota Badlands not being the same. It is much less colorful, ranging from dull white to light tan, and the features are smoother. But Wall Drug makes it worth the trip, not to mention the Black Hills. Well then, back to the highway for me, Gents. I've got a lot of driving to do again today. Do you need an assistant, Lou? Sounds like a great job! I can cook on a camping stove, read maps, and talk about lots of interesting things for hours. Lou, that's why so many Scandinavians, Finns included, chose Minnesota when they emigrated to the United States. Reminds them of home. Hasse Wind, while that has been the reason noted in numerous sources over the years for the Scandinavian immigrants settling in Minnesota, it always makes me chuckle. Allow me to illustrate why. The actual reason this hardy stock of the Norsk, Svensk, and Finsk gods chose to settle where they did in the "new country" was due to the fact that, at the time, this was where the large tracts of free land were available. The Federal Homestead Act of 1862 allowed for just about anyone who wanted to lay claim to 160 acres of "tillable" land so long as they were willing to break the ground, put in crops, built a dwelling, and live on the property for a few years. Once they had accomplished that the land was theirs for keeps. When the large waves of Scandinavians sailed into New York Harbor in the mid-to-late 1800's the upper Midwest was the nearest place to go for the free land they all wanted to grab for a chance at a new life. And so they came. My own little house on the prairie sits in Bergen Township which was originally settled by a pair of Norwegians who, sometime in the 1860's, after travelling as far as they could by rail, walked 300 miles from eastern Wisconsin to reach an area of available land they could lay claim to. They spent the summer breaking sod and clearing trees before walking back to Wisconsin to "winter over". They then came back the following spring and built a pair of sod huts, (one on each of their claims), and began in earnest the long hard job of creating a home and a life in "Amerika". This same pattern was repeated by hundreds of thousands of newcomers in the upper Midwest over the next several decades. Olham, I'm always willing to train a new assistant in the alluring ways of ambulance sales and service in the upper Midwest. Well, that land in the lower pic is definitely better for agriculture. As my knowledge about immigration and the US is clearly outdated, can you recommend me any good books on the subject? I love books of all kind and am always looking for new ones (and I'm also running out of room with all my books, but they are too dear for me to sell or give away). PS. Skol should be skål. Or you could also say kippis for the Finns. are more flat. Denmark even flatter. Great picture Hasse Wind, it's beautiful, thanks for sharing. I would love to travel around that area of the world. And you are quite right of course about "Skål". I was tired when I posted so I took the shortcut with the Americanized "Skol" since I do not have the accented "a" on the keyboard of my laptop, (and did not take the time to google and cut and paste the needed punctuation). But as one who truly does like things accurate I appreciate the correction on your part Sir. As to books on the subject of immigration, mine are all leftover texts from my college days about a millenium ago. Olham, very true about those large flat areas of Sweden, Finland, and Denmark. However, the majority of the Scandinavian immigrants were not "landed gentry" so even if they had lived in those regions they would not likely have owned property. Also, the average size of a farm in those countries back then was around 7 to 10 acres, (if memory serves), so most folks were involved in subsistence agriculture at best. Just imagine what they must have felt when they first saw the endless miles of open prairie available to them in the "new land", with top soil so thick and rich it could support any crop they might wish to plant for years to come. And they were going to be given 160 acres of it for free! All they had to do was cut away the 16" thick sod that covered it all; dig a well; build a house to live in; plow and plant and tend and sow; clear rocks and trees, (if they were lucky enough to have trees on their tract); survive the storms and winds and floods and droughts; survive the insect infestations; survive the Indian attacks; survive the flu and small pox epidemics; do all that and then some and raise a family in the process and you have the midwest version of the American Dream in the last half of the 19th century. And they came in droves to live it, and counted themselves blessed to have the chance to do so. Oh Pioneer! To but have such spirit in this country once again. Off to Fargo for now, and points beyond, but I should be home by tomorrow night.